« New MX ScorpionX and WidowX Robot Turrets! Check out the new WidowX Robot Arm! 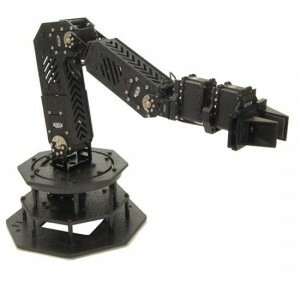 Our newest creation, the WidowX Robotic Arm is our smoothest, most powerful arm to date! The MX series actuators provide a full 360 degree freedom of movement in the base, ultra-high resolution of up to 0.088° , user-definable PID parameters, and extremely smooth interpolation. The hefty MX-64 shoulder servo gives the WidowX very strong lifting strength in a slim frame. If you are looking for medium lifting strength and desire smooth control, high accuracy and repeatability the WidowX is a great mid-level arm choice. Learn more about the arm here, and stay tuned for videos of this arm in action! This entry was posted on Wednesday, November 28th, 2012 at 5:37 pm	and is filed under Front Page News, Misc, New Kits / Products. You can follow any responses to this entry through the RSS 2.0 feed. You can leave a response, or trackback from your own site.